Having attended three Independence Day parties a week ago, I was struck by the fact that all the other guests referred to the holiday as the Fourth of July. Why is that? Why do we say to each other: “Have a happy Fourth of July,” and not: “Have a happy Independence Day”? We celebrate Christmas, not Dec. 25. Has anyone ever wished you: “Have a happy Dec. 25”? Or, “Have a happy Fourth Thursday in November”? No, we wish each other Merry Christmas and Happy Thanksgiving. We celebrate “Halloween,” not Oct. 31, “New Year’s Eve,” not Dec. 31, and “New Year’s Day,” not Jan. 1. The Paschal full moon, by the way, is supposedly the first full moon after the vernal equinox in the Northern Hemisphere. However, the Paschal full moon doesn’t necessarily occur when there’s a full moon in the sky. It can be off by a day or two — whatever’s needed to make computations work out. 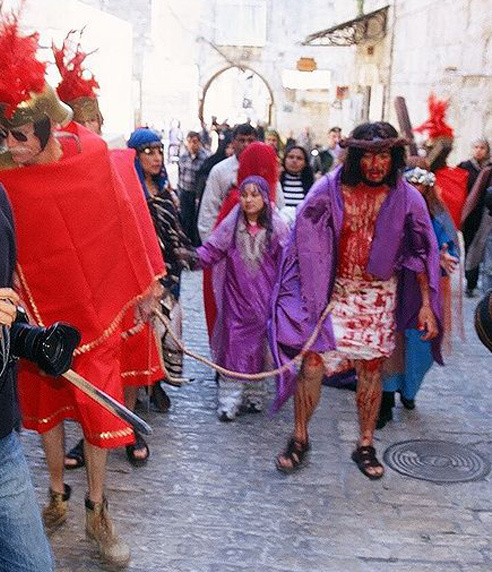 The First Council of Nicaea, a council of bishops meeting in what is now Turkey back in 325 AD, settled on this loony way of calculating Easter’s date. It basically amounted to tweaking the traditional Jewish calendar. 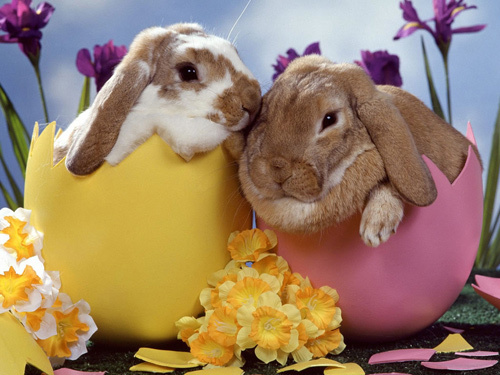 As a result, Easter Sunday this year was April 24. Last year it fell on April 4. In 1213, it will be March 31. Not counting 9/11, which is hardly a time of celebration, the only large observance in this country referred to as a date and not by what it memorializes is Cinco de Mayo. Ironically, the event, which recognizes Mexican pride and heritage, is celebrated more widely in the United States than in Mexico. It is not Mexico’s independence day, which is Sept. 16. Cinco de Mayo is Spanish for May 5. That was the day in 1862 when Mexican forces — despite being greatly outnumbered — defeated French forces at the Battle of Puebla (right). And while the victory gave Mexicans a sort of David-and-Goliath sense of pride, it did not end the fighting. France, which was then ruled by Napoleon III, was trying to establish a Latin empire, and despite their defeat in Puebla, French forces a year later defeated the Mexican army and made Emperor Maximilian the ruler of Mexico. The French, however, were expelled in 1867, and Maximilian was executed. 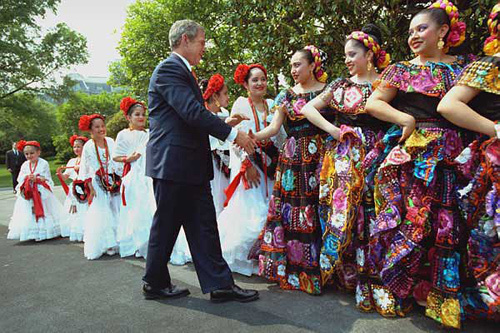 President George W. Bush greeting Cinco de Mayo dancers at the White House. In Mexico, Cinco de Mayo is celebrated primarily in the region around Puebla and in a few other places. In the United States, however, President Bush in 2005 issued a proclamation urging US citizens nationwide to observe the day with ceremonies and festivities. There are now more than 150 Cinco de Mayo celebrations, which each year are held in more than 20 states, and the numbers are growing. Or so I read. 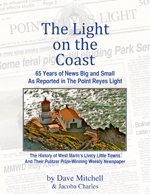 In San Francisco, the event always draws large crowds. Mexicans, I might note, refer to their independence day as Grito de Dolores (“Cry of Dolores”) or El Grito de la Independencia (“Cry of Independence”). It marks the beginning on Sept. 16, 1810, of an 11-year-long war that achieved independence from Spain. 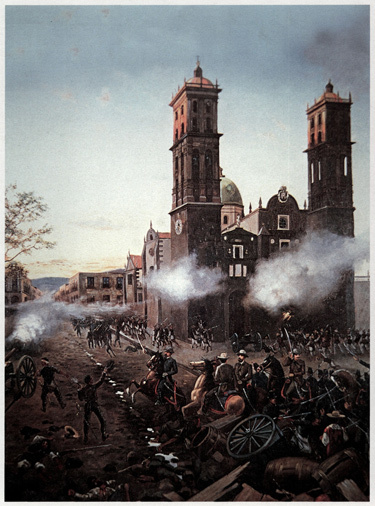 The “cry” was made by a Catholic priest, Miguel Hidalgo, who standing outside his cathedral in the town of Dolores exhorted Mexicans to revolt against the Spanish. As it happened, I visited Dolores (now called Dolores Hidalgo) in 2006 and was much impressed by the town’s garden-like plaza and Spanish Colonial buildings. The old cathedral still stands. What a charming place, I thought, for launching a revolution. It’s good to read about Cinco de Mayo in your blog, as a reference to those two holidays name by the date, and how important that celebration has become in US. In Mexico, Cinco de Mayo day is also known as “La Batalla de Puebla” (The Battle of Puebla). It is celebrated all over the country, as many other non religious holidays, with major emphasis in Puebla, of course, and Mexico City. Accounts in official history tell us about “the outnumbered Mexican forces” (not true) defeating the “better armed” French (that’s correct, and the main reason why nobody went for the Mexicans). The forces were about the same, some 5,000 each. The heavy rain at the time and the terrain getting muddy were the main causes of the outcome, plus other “warfare technical circumstances”. In Mexico, it is not the practice to wish anybody a happy (any) holiday, except for Christmas and New Year’s, and perhaps Mother’s or Father’s days, when you tell that to your parents; unlike here, where everybody wishes you happy anything the day anything is celebrated. To say there “happy Independence day, or September 16th” (or 5 de Mayo, or 20 de Noviembre or any of the high number of official and religious Mexican holidays), is unthinkable. A big cultural difference, that’s what it is. Independence is celebrated the night of the September 15th with “La Noche del Grito”, when in the balcony of the National Palace, the President takes over and shouts (grita) to the big crowd in the main plaza — what the priest Hidalgo supposedly did in Dolores in 1810 — plus other political-patriotic stuff. That is repeated in every city and town with a Palace and main plaza (almost all), and even here at the Mexican Embassy and each Consulate, as well as in the rest of the world where Mexico has an official representation. By far, that’s the main holiday; so Mexicans gather that night (called “Noche Mexicana” or Mexican Night) at home or at somebody’s big house to do the same, while enjoying Mexican snacks and watching “El Grito” in Mexico City on national TV. Sparsely Sage and Timely is powered by	WordPress 4.9.10 and delivered to you in 0.382 seconds using 54 queries.